This famous French naturalist was born Georges-Louis Leclerc in 1707. 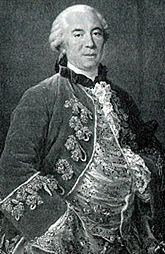 Mindful of the boy's future, his father shrewdly acquired the holding of the village of Buffon, whose name Georges-Louis Leclerc would eventually assume. Ironically, just when Buffon began using the name, he nearly lost it. Buffon's widowed father had remarried, jeopardizing the inheritance left by Buffon's mother. Even worse, he had administered the family estate poorly and was forced to sell Buffon's holding of the village. Buffon sued his father to secure his own inheritance. Whether he actually won the lawsuit isn't certain, but he was compensated, and he bought back both the village and the name. The young Buffon earned a diploma in law at the age of 19 then, to his family's horror, abandoned law for science. After a fairly brief stint in mathematics, he moved on to natural history. Over the years, he established a long list of successes — and enemies. Fellow savants disliked him for his hasty assertions and grand ideas — whether or not he deserved it, he had a reputation for never personally examining any wild animal he described. Even more, his contemporaries resented his literary and political successes, and they seethed when the first edition of his Natural History sold out in several weeks. If Buffon minded their displeasure, it was hardly obvious. Commitments forced him to be in Paris regularly, mostly to direct Jardin du Roi, one of France's leading scientific institutions, but he preferred his own science park at Montbard, near the village of Buffon. It was largely in isolation at Montbard where he felt most comfortable and did his best work. Although some considered him hasty, Buffon defined genius as "a greater aptitude for patience" and his own sustained patience was legendary. He tamed and studied wild animals in his home for years, all the while remembering that captivity surely changed their behavior. He undertook studies of microscopic organisms. He built a "burning mirror," based on Greek accounts of a similar design by Archimedes, and used it to set fire to wooden buildings as much as 200 feet away. His directive — to his employees and himself — was "Do not waste time," and he stuck to a 14-hour daily regimen that he continued well into old age and poor health. He even paid a servant a crown every day just to wake him at 5 a.m. One day, so the story goes, the servant could wake Buffon only by throwing cold water on him. Buffon promptly got out of bed and gave the servant his promised crown. 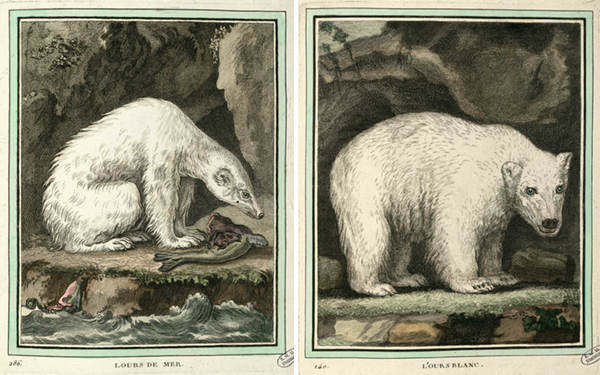 Buffon's discipline paid off; beginning 1749, he published 36 volumes of Historie Naturelle ( Natural History ). Eight more volumes were published after his death. The initial intent of Natural History was to inventory Jardin du Roi. Buffon originally, and apparently foolishly, figured that he could cover everything in 15 volumes: nine for animals, three for plants, and three for minerals. After 15 volumes, he'd only gotten to the letter M (as in monkey). Birds filled nine more volumes, and minerals five. And he never did get to fish, reptiles, bugs, or plants. Buffon apparently felt a particular affection for birds. After ranking the senses (sight, hearing, touch, taste and smell) in humans, quadrupeds, and birds, he went on to discuss the sixth sense, namely love. Buffon didn't credit quadrupeds with a strong sense of love so much as carnal desire, but in birds, he argued the sense was "softer, more tender, and more endearing passion" both between avian sweethearts, and between parents and offspring. Some of Buffon's most important writings in Natural History related to anthropology. In the 21st century, a few holdouts still hotly contest human evolution from apelike ancestors, yet during Buffon's lifetime, many speculated that apes were simply inferior humans, degenerate children of Adam. Buffon compared the "most apelike" people, the Khoisan (or "Hottentots") of southern Africa with the orangutan, considered at that time to be the "most humanlike" ape. He concluded that the orangutans were apes and the Khoi-San were people, a conclusion we can probably call a step forward in race relations. He also disputed the common notion that humans consisted of multiple species. Everything therefore comes together to prove that humankind is not made up of essentially different species, that to the contrary there was originally only one sole species, which, having multiplied and spread itself over the entire surface of the Earth, underwent different changes, though the influence of the climate, differences in food, diversity in way of life, epidemic illnesses, and also the infinitely varied mix of more or less similar individuals . . .
Of course, Buffon was not without prejudice, describing native Africans as having "little intelligence" but "a great deal of feeling." He contributed his own blunders to science, insisting that "a niggardly sky and an unprolific land" stunted New World inhabitants. He even blamed "lazy, stupid" Native Americans for the smallness of American wildlife. New World degeneracy was an idea Thomas Jefferson vigorously disputed and one Buffon himself later abandoned, perhaps because some fellow believers in New World degeneracy made the unappealing claim that Europeans settling in the Americas were also prone to degeneration. In later editions of On the Origin of Species , Charles Darwin included historical sketches in which he credited earlier discoverers of evolutionary theory. Darwin characterized Buffon as "the first author who in modern times has treated [evolution] in a scientific spirit." But although Buffon's writing suggests evolutionary ideas, he was no evolutionist, at least not in the modern sense. He recognized that humans could change over time, but didn't consider the possibility that we could have arisen from another species. Instead, he suspected that a separate prototype existed for each species, though he thought the prototype subject to modification, and recognized overlaps between different species. It may sound surprising, but Buffon disdained one of the other great minds of 18th-century science: Linnaeus. 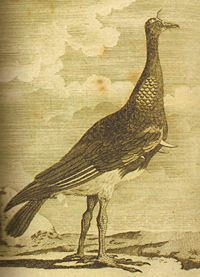 One issue dividing the two was whether species were fixed and unchanging (as Linnaeus believed). Buffon saw nature in a constant state of change, and considered the Linnaean system as a kind of straitjacket. In a broader sense, Buffon didn't object to classification in general but found the Linnaean system — and many others — arbitrary. He criticized Linnaeus for classifying humans in the same group as monkeys, sloths (the "lazy" animal Buffon despised the most) and scaly lizards. Buffon's own efforts at classification tried to arrange organisms by their community of origin, and in this effort, he was a pioneer. Linnaeus, meanwhile, named a particularly stinky plant Buffonia. No stranger to controversy, Buffon championed risky ideas his whole life. Alleging that "everything that can be, is," he hinted that nature created every conceivable type of animal and eliminated the unfit through trial and error — a pretty cold notion at a time when few people accepted extinction. He speculated that Earth-like life might exist on other planets. And he addressed the age of our own planet. Isaac Newton had observed the unlikely coincidence that all the planets rotated around the sun in the same direction, and within 7.5 degrees of each other. Buffon calculated that the odds against this happening — if all the planets had formed independently — were 7,962,624 to 1. He then concluded that the planets had been formed by a comet crashing into the sun. He said as much in his first volume of Natural History in 1749. The Faculty of Theology of Paris was not amused, and pressured Buffon to retract his statements. He did, but not with much sincerity, telling a friend simply, "It is better to be humble than hanged." In 1749, Buffon saw the Earth's history as cyclical, with neither a beginning nor an end. James Hutton and Lamarck later took up this idea, but Buffon himself ultimately dropped it. In the 1760s, Buffon started a series of experiments heating iron balls until they glowed white, then measuring how long they took to cool to room temperature. He didn't use a thermometer for these experiments; he relied on touch alone, yet his results were surprisingly accurate. Next, he heated and cooled a variety of materials including sandstone, glass and various rocks. What he hoped to learn from these experiments was the age of the Earth. Buffon now believed that the Earth indeed had a beginning, and it was originally a molten mass too hot for any living creature. It had to cool before it could support life. In 1778, he published Les Epoques de la Nature , asserting that the Earth was 74,832 years old and that humans were relative newcomers. "For 35,000 years our globe has only been a mass of heat and fire which no sensible being could get close," he stated. "Then, for 15,000 or 20,000 years, its surface was only a universal sea." In the late 18th century, suggesting an age of nearly 75,000 years was staggering, yet the number was timid compared to Buffon's private speculations. When he considered the amount of time needed to build mountains of chalk from the remains of marine organisms, he knew tens of thousands of years was far too little time. He toyed with an age for our planet of at least 10 million years. Buffon shied away from publishing as much, not because he feared religious reprimand — by then he was too influential to have to worry — but because he doubted he had enough evidence to make the assertion stick. In fact, the Jesuits in France were pretty enthusiastic about his work, and complained about it only under pressure. Though Buffon's numbers were off (our planet is now estimated to be about 4.6 billion years old), his sequence of events is echoed by modern theories about Earth's development. Buffon's revised theory of the Earth had an interesting footnote. Since the planet had started out so hot, he hypothesized, life must have first developed in the far north. Siberia, in fact. His assertion prompted a flattered Catherine the Great to shower him furs, gold medals and a diamond-encrusted snuff box. But the discovery that the Siberian mammoth was not, in fact, quite the same species as the modern Indian or African elephant helped disprove that particular argument in the end. Throughout his illustrious career, Buffon continued collecting taxes from the little village of the same name. He wasn't especially generous with the local peasants, but never had serious disputes with them either, though some Revolutionary legends described him as malevolent. Buffon was lucky enough to die shortly before the French Revolution started, but his son, nicknamed Buffonet, wasn't so fortunate. Accused of participating in a conspiracy, Buffonet was executed in 1794, and his last words were an homage to his father: "Citizens, my name is Buffon."